Styles on this page are non-adjustable safety glasses, sometimes referred to as one size fits all. Lenses block 99.9% of UV rays. Please see our Task specific lens colors chart for information on the differences between the available lens colors. To clean anti-scratch or anti-fog lenses, please see our Lens, respirator wipes page. Other styles on our Adjustable safety glasses page, include at least one adjustable feature such as nosepads, temple length, lens angle, or expandable brow bar. 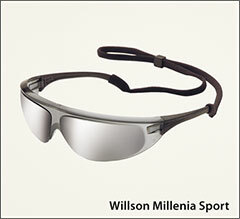 Millennia® Sport comfortably safeguards your eyes. Superior side and brow protection. Close fit protects against flying particles. Universal nose bridge. High impact dual 9-base wrap-around unilens style. Includes an adjustable, break-away FlexiCord for added security and convenience. Frames are black nylon. Meets ANSI Z87+ and CSA Z94.3 standards. Sold by the box, 10/box. Bandido® is an economical, frameless design with black accent, and made in the USA. Meets ANSI Z87+ standard. Sold by the box, 10/box. Ignite™ a sleek, wrap-around style. 9-base unilens provides close-to-the-face protection. Frameless design offers complete, 180° distortion-free vision. Soft, saddle pad nosepiece reduces slippage. Temple tip pads provide comfortable, secure fit. Meets ANSI Z87+ and CSA Z94.3 standards. Sold by the box, 10/box. A800 delivers ultra-lightweight, sport styling at a very attractive price. 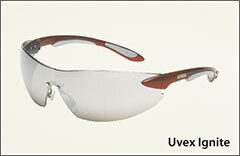 The stylish wrap-around 9-base lens offers unobstructed field of vision and high impact protection. The temples feature sport styling with extra flex for more comfort and a secure fit. Meets ANSI Z87+. 10/box but sold in any quantity. Polysafe® fits over most prescription eyewear. Superb optics provide a clear, distortion-free field of vision. Indirect vents help prevent fogging. Single piece wrap-around lens with integrated side shields. Comfortable contoured nose bridge. Weighs only 1.4 oz. Wide brow guard provides smooth brow contact for added safety and comfort. Frames and lens are clear. Polysafe Plus model is same except lens has anti-scratch coating for longer life and reduced glare. Meets ANSI Z87+ and CSA Z94.3 safety standards. Sold individually. A700 offers economical and stylish eye protection with a secure wrap-around design. Soft temple tip pads provide a comfortable, secure fit. Polycarbonate, distortion-free, hardcoat lens. This style offers you the most lens tint options. Meets ANSI Z87+ and CSA Z94.3 standards. 10/box but sold in any quantity.